Although February is the shortest month of the year, it is full of daily festivals for some of the most celebrated saints of the Orthodox Church. Almost every day in the month celebrates a well-known and beloved saint, such as: St. Tryphon the Martyr (Feb. 1), St. Isidore of Pelusium (Feb. 4), St. Agatha the Martyr (Feb. 5), St. Boukolos of Smyrna (Feb. 6), St. Photios the Great (Feb. 6), Sts. 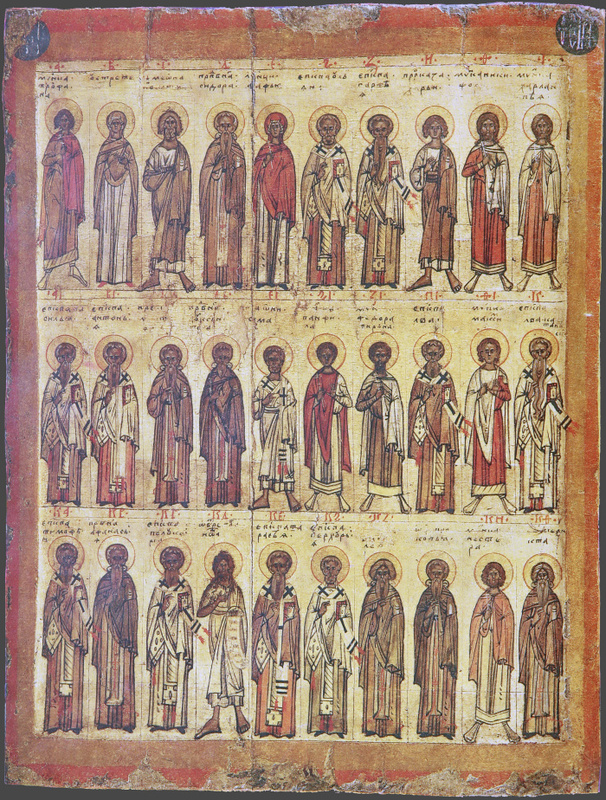 Barsanuphios and John (Feb. 6), St. Parthenios of Lampsakos (Feb. 7), Hosios Loukas (Feb. 7), St. Theodore Stratelates (Feb. 8), St. Nikephoros the Martyr (Feb. 9), St. Haralambos (Feb. 10), St. Blaise of Sebaste (Feb. 1l), St. Theodora the Empress (Feb. l1), St. Meletios of Antioch (Feb. 12), Sts. 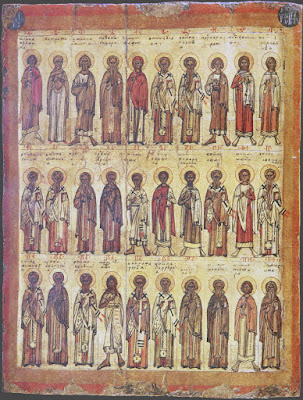 Aquilla and Priscilla (Feb. 13), St. Auxentios (Feb. 14), St. Onesimos (Feb. 15), St. Theodore the Tero (Feb. 17), St. Leo of Rome (Feb. 18), St. Philothei of Athens (Feb. 19), St. Polycarp of Smyrna (Feb. 23), 1st and 2nd Findings of the Head of John the Baptist (Feb. 24), St. Tarasios (Feb. 25), St. Porphyrios of Gaza (Feb. 26), St. Photini of Samaria (Feb. 26), St. Prokopios the Martyr (Feb. 27), St. John Cassian (Feb. 28 or 29), among many others. The greatest festival of the month of February is the Feast of the Reception of the Lord celebrated on February 2nd. This feast liturgically falls forty days after Christmas on December 25th, and is one of the Twelve Great Feasts of the Orthodox Church. It is called "Reception" (Gr. Hypapante), since Christ was received by Symeon at the Temple, as recorded in the Gospel of Luke. Though liturgically this feast naturally falls in the month of February and is one of the oldest feasts of the Church, it is rather ironic as well since the word February means "purification", and one of the acts we commemorate today is the ritual of purification the Virgin Mary went through according to the Mosaic Law. This festival continues into February 3rd, on which we celebrate Saints Symeon and Anna, the principle characters of the feast. The afterfeast of the Reception of Christ lasts seven days, until the Leavetaking of the Feast on February 9th, though this may be shortened or omitted altogether if February 2 falls on or after the Sunday of the Publican and the Pharisee. Because the Triodion period usually begins in the month of February, and sometimes even Great Lent begins, the month of February has no other major celebrations, focusing rather on the solemn days that immerse us into the moveable themes of the Triodion and Great Lent. The Triodion is a period of three weeks that help us to prepare for the rigorous fasting and praying of Great Lent. It begins on the Sunday of the Publican and the Pharisee, which is followed by a fast-free week. The next Sunday is the Sunday of the Prodigal Son, and fasting is observed only on Wednesday and Friday of that week. The Sunday of the Last Judgment, also known is Meatfare Sunday, is followed by a week of fasting from all meat, though milk products are allowed to be consumed. The last Sunday of the Triodion is known as the Sunday of Forgiveness, or Cheesefare Sunday, and is the last day in which milk products can be consumed. The next day is Clean Monday, when the strict fast of Great Lent begins. It should be noted that the Saturday before Meatfare Sunday is the first of three consecutive Saturdays known as the Saturday of Souls, when we focus on special prayers for the dead. This sums up the month of February in the Orthodox Church, which has a primary theme of purification. We are reminded of this first with the Feast of the Reception, when the Virgin Mary underwent the purification ritual, and then with the period of the Triodion, in which we not only purify our household of various foods to prepare us for Great Lent, but we also begin to purify our hearts and thoughts, as the hymns of this period enjoin us to do, as we are about to enter the most solemn and sober and profound period of the liturgical year. Lastly, we are reminded that this is a month of purification by the name of the month itself, since the Latin term februum after which it is named means purification.